These days, most militaries will issue helmets made of Kevlar, which is lighter than their metal predecessors and the ergonomic design of these helmets have been altered to allow for interchangeable accessories like night vision optics, lights and a variety of other devices. 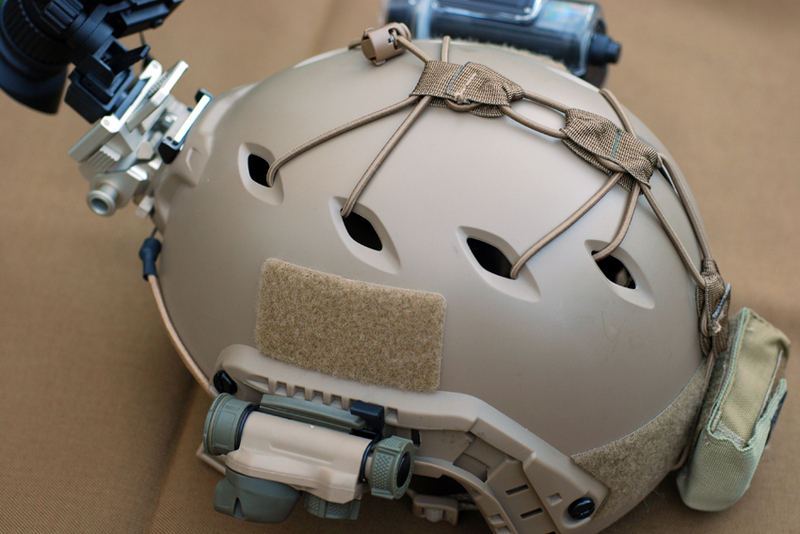 Beyond the issued gear, even more improvements have been made by companies like Crye Precision, Team Wendy and Ops-Core, who offer lighter and more versatile helmets, in a variety of materials, from Kevlar to Carbon Fiber to impact resistant plastics. In this article, I’ll be exploring one of those varietals with which I have a fair amount of experience using and have a small assortment of accessories I’ve acquired to use with it; the Ops-Core Base Jump Military Helmet. I’m by no means implying that I think the Ops-Core helmet is better than the other available helmets; it’s simply the one I’ve invested some time and money into setting up. Depending on what purpos you intend to use a helmet for, your mileage may vary. As a civilian, I chose the Base Jump helmet largely because I don’t feel much need for a ballistic helmet, as it’s fairly unlikely that I’ll need it to protect my dome from small arms fire. I also chose it due to its low weight (1.46 lbs in L/XL) and ARC rail system, for which many gear manufacturers have made a variety of accessories which I’ve found useful for a number of different applications. What do I use these helmets for? Statistically, I get the most use from them (I own two; one black, one tan) for biking and for recording video in either training situations or recreational situations. Shown above is the rear of the black helmet worn for biking. 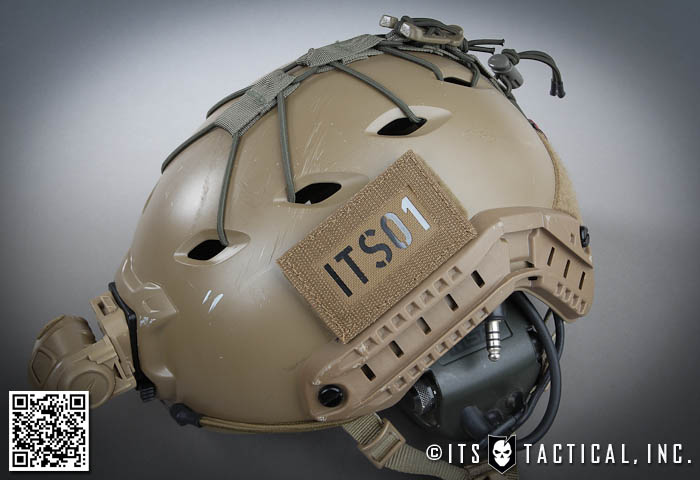 On that helmet, I have added a First Spear Ops-Core Helmet Cover, which is made of a stretchy soft-shell material that keeps rain from coming in through the holes on the top and still allows the addition of Velcro patches in the same spots the Ops-Core allows them. I keep two high-vis reflective patches and one SOLAS patch on the helmet, which light my head up pretty brightly under car headlights. 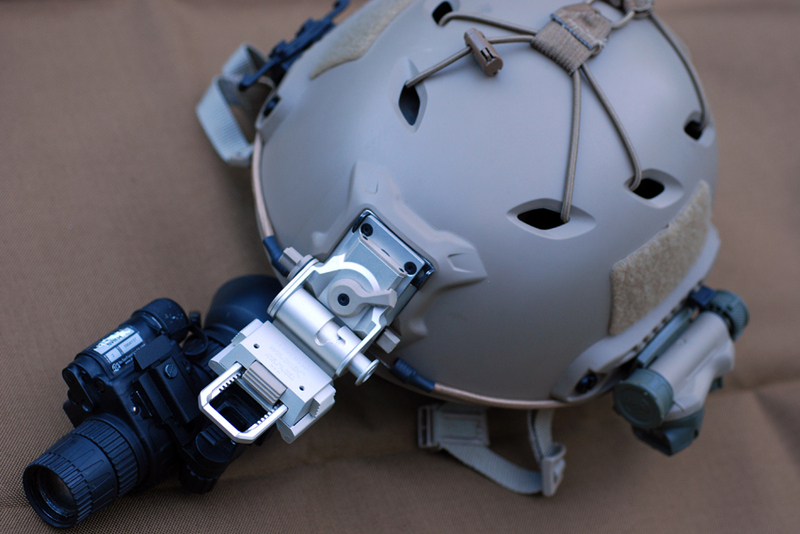 On the front of the helmet, I keep a Princeton Tec Remix Pro headlamp mounted to the molded front NVG mount. The headlamp is fairly bright at 125 lumens, but isn’t used so much to illuminate my path as it is to alert people that I’m on the road with them. The Remix Pro is easy to aim up or down without removing the helmet and equally easy to turn on or off, as needed. It also uses a single CR123 battery and I’ve got pretty great battery life from it over time. For example, in a little over two years of doing a fair amount of nighttime biking, I’ve only had to replace the battery twice. Generally, for biking, I stick with sunglasses to protect my eyes (even at night; I’m using Numa glasses with replaceable lenses, so for evening riding I just insert the clear lenses), as they’re easy to take on or off and pocket them as needed. 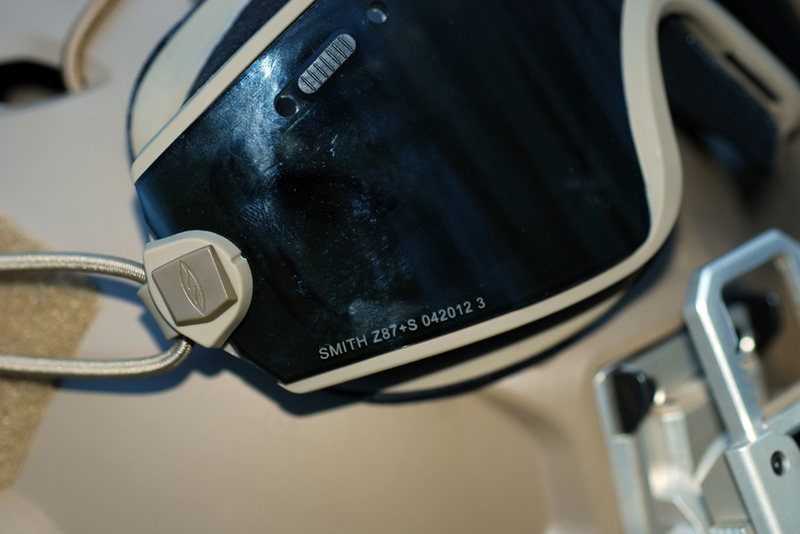 On occasion, I have used the Smith Elite LoPro Regulator goggles with the Smith Boogie Bungee attachment system. However, generally I avoid using these for one main reason; they make the wearer look a little crazier than necessary while biking. In a skiing context or during a rifle class, it matters much less, but biking in an urban environment, it’s probably a better idea not to draw undue attention to your eyewear. I want motorists to see that there’s someone on a bike in front of them, or behind them, but I don’t really want them spending much time wondering why I’m wearing goggles. Sunglasses look normal, so I stick with those. 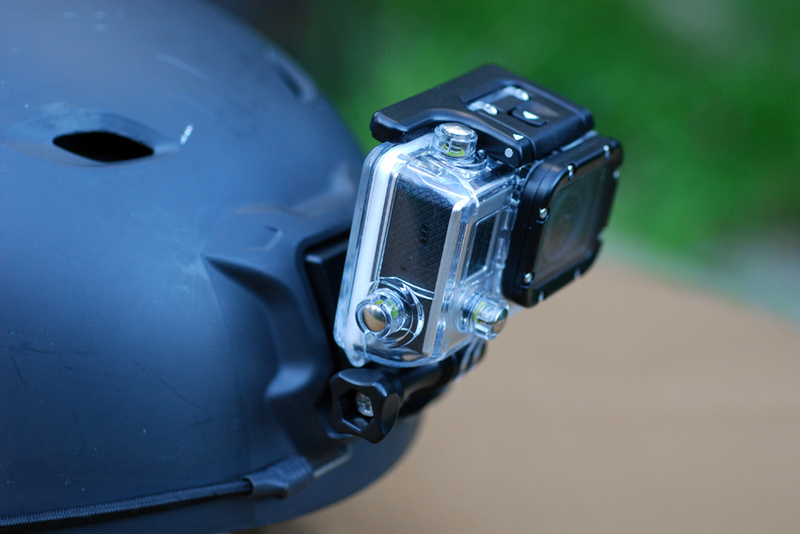 Depending on when and where I’m biking, I’ll sometimes remove the headlamp and attach the GoPro Hero 3 camera to capture video or stills from wherever I’m riding. I also generally use this same attachment when capturing footage from firearms training or on other occasions that I want to record video of an experience. For instance, I chartered a helicopter flight over the Bay Area some time ago in order to take a bunch of photographs with a DSLR camera.For that trip I wore my biking helmet with the GoPro in order to capture video of the entire flight, in addition to the stills I was taking with the DSLR. The camera can be started, then promptly forgotten, as it feels nearly weightless on the helmet, freeing your hands up to do whatever it is you’re doing. This is obviously beneficial for things like firearms training, where what your hands are doing is pretty important; much more important than fiddling with video gear to capture the experience. If you ever find yourself taking a night shooting class with NODs, the Base Jump helmet is an excellent platform on which to mount not only the night vision device, but also IR illumination, utilizing the side rails. 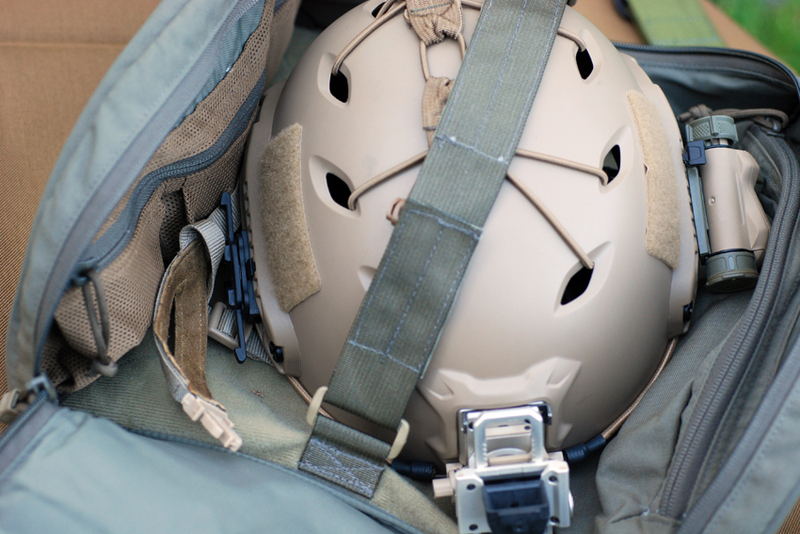 There are other non-helmet means to mount the NODs, like the Crye Nightcap or the Ops-Core Skull Crusher, but those are dedicated solutions that don’t provide the other benefits the Ops-Core Base Jump or other helmets provide, namely impact protection. 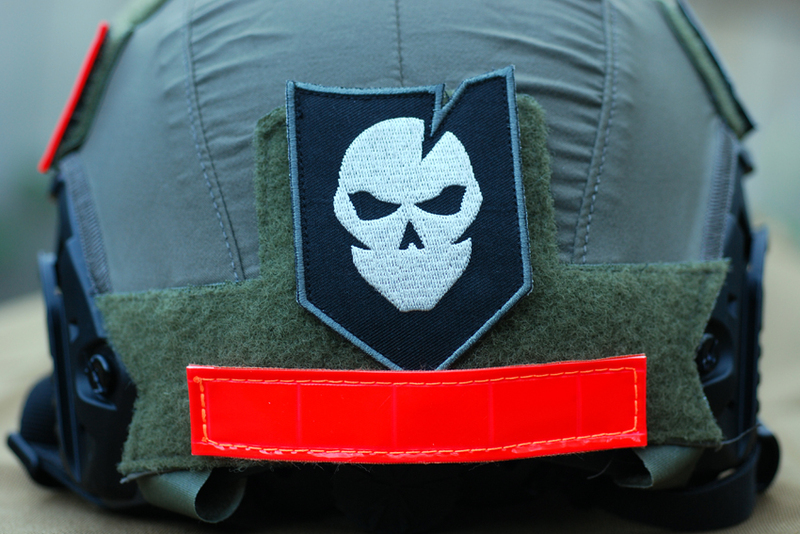 To be honest, I own a Crye Nightcap, for which I then had to get a shroud for in order to actually use it with NODs and it still doesn’t feel as comfortable to me as the Ops-Core Base Jump helmet. 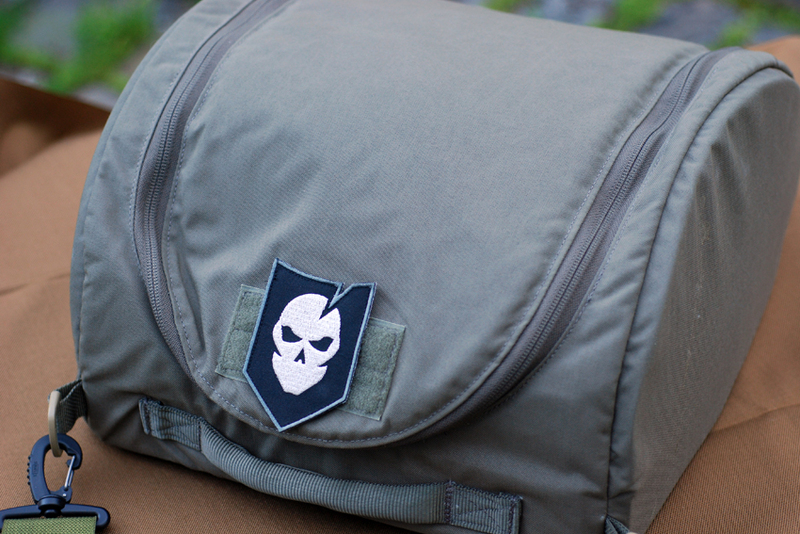 This is also despite the fact it can be folded up to take less space in a pack, or even a pocket. As a result, for the third main purpose of these helmets, I still tend to use the Base Jump helmet, which we’ll get to shortly. In the photograph above, I’ve got the Base Jump helmet fitted with a Wilcox L4 NVG mount, on which is attached the ATN NVM14 I maintain for personal use and a Petzl STRIX IR light mounted on the left side of the helmet. The Wilcox L4 mount is a bit pricey, but when compared to ATN’s own mounting bracket, it really isn’t that much more and all of these mounting brackets are costly in their own right, due to the engineering that goes into them. 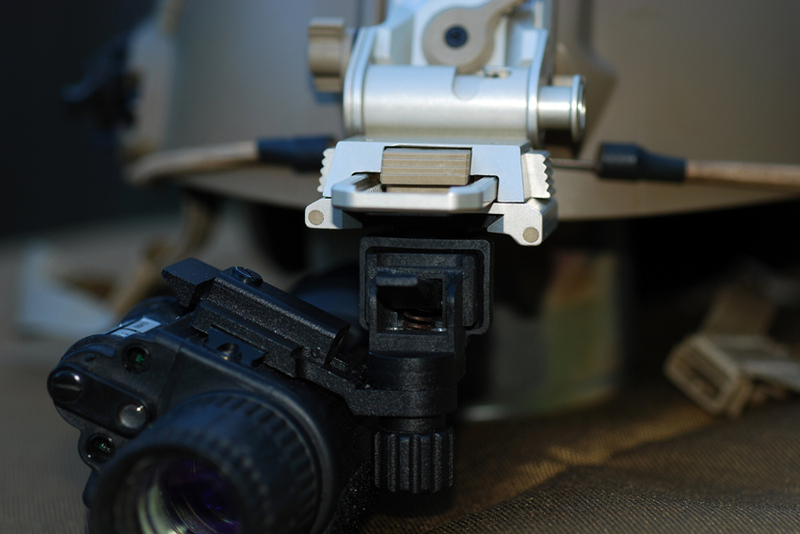 It’s also important to consider the fact that you’re likely using them to attach a night vision optic worth a couple thousand dollars to your head, so making sure that the method you use to attach them is solid, means you’re less likely to bump your NODs or knock them off and send them flying to a certain doom on the ground. 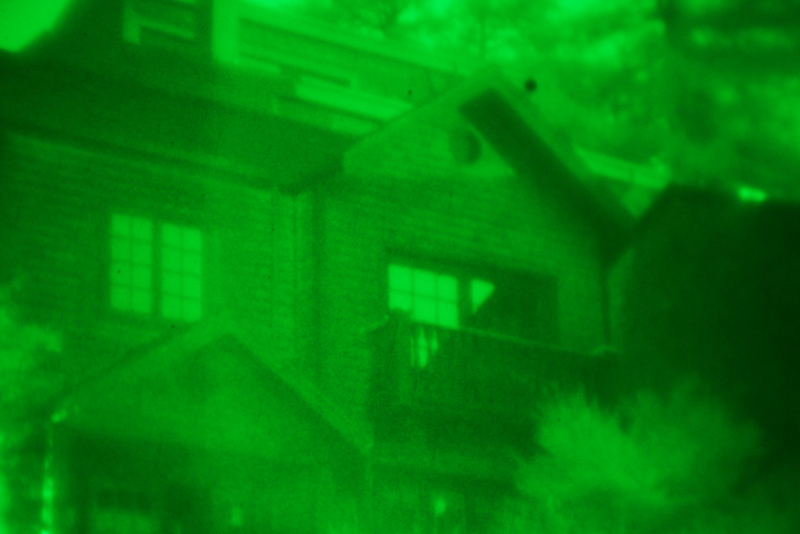 I won’t offer any endorsements or suggestions as to the type of night vision optical device you may wish to buy; that’s a lengthy subject in and of itself and largely boils down to how you intend to use it and how much money you’re comfortable spending. As for the Petzl STRIX IR, I’ll give it high marks for ease of use, battery life and effectiveness in lighting up your field of view, at least within 25 yards, through the NODs. One other item to consider is some form of counterbalance weight, to offset the weight of the NODs when mounted on the helmet. While the Ops-Core helmet’s strap system does a fantastic job of securing the helmet and accessories to your head and still feeling really comfortable, you may find the weight of the helmet a little front-heavy if you’re wearing it for multiple hours at a time. This is more of a concern in situations like an 8-hour night shooting class than it is for the final uses I will discuss, but it can be a concern. 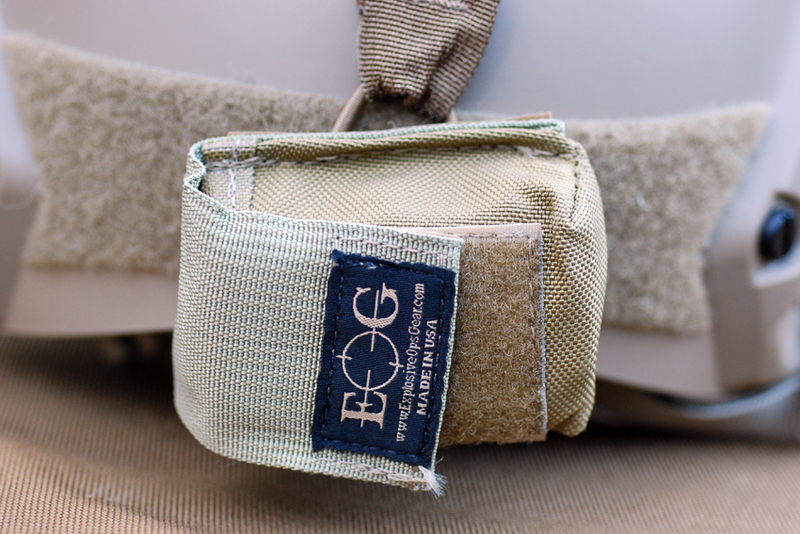 For my own purposes, I went with the Explosive Ops Gear “Little Big Man,” which is basically just a small nylon pouch with a set of small lead weights which you can add or remove until your head feels a little more balanced. Also keep in mind that you can remove those weights and replace them with some spare CR123 batteries if you’d like, keeping all the power you may need right there on the helmet you’re wearing. Batteries obviously weigh less than lead weights, so in the past, I’ve ended up putting a four-battery hard container in there and then stuffed one of the lead weights in under them, before closing the pouch. 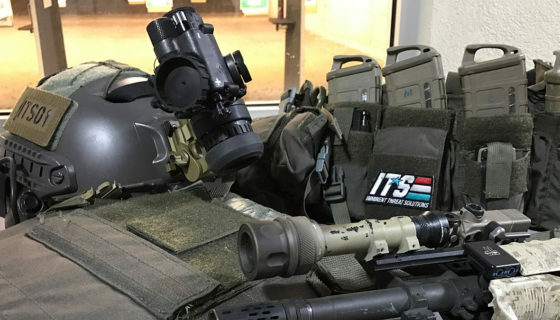 One final thing to consider for night shooting uses of the Ops-Core helmet is hearing protection. 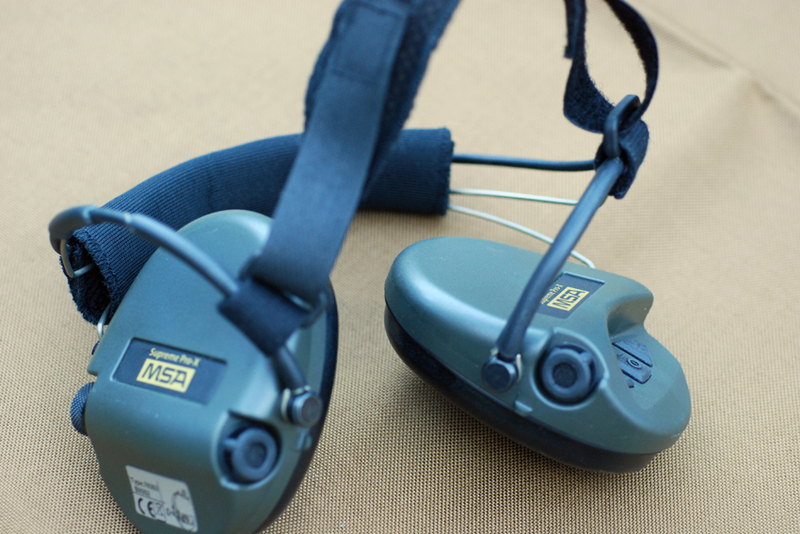 There are a number of options for hearing protection, but if you want to go with electronic earpro, you’ll want to factor in the helmet’s interference with normal over-the-head suspensions. In my experience, I haven’t been able to wear over-the-head earpro with the helmet on top; the headband prevents the helmet fitting right. Fortunately, there are options; MSA makes a version of their Sordin Pro-X earmuffs with a neckband, rather than the over-the-head band. It still has a cloth band that goes over the top of your head, but the bulk of the suspension is managed by the band that goes behind your head and rests on your neck. 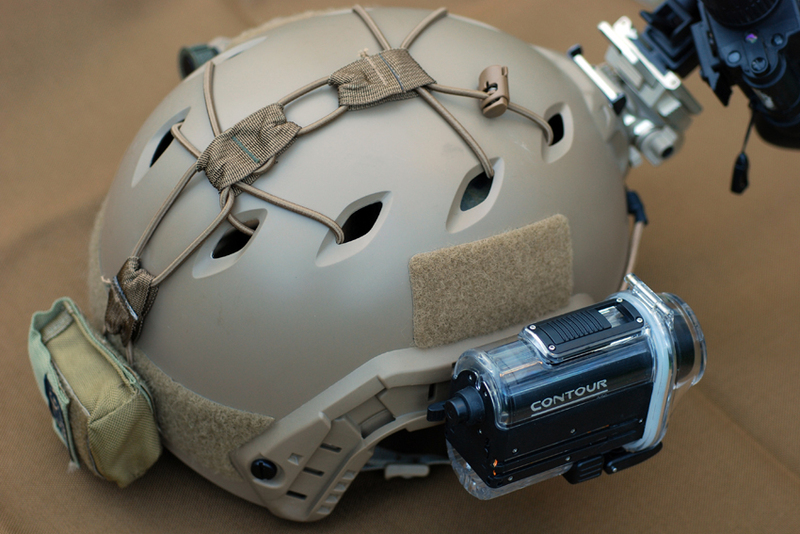 Beyond using the Ops-Core Base Jump Military helmet for purposes like biking (or, for that matter, “base jumping”), recording POV video and firearms training, there lies one much more important justification (or rationalization, depending on how you look at it) for owning a helmet; basic preparation for situations in which your own personal safety is a concern. For me, this purpose boils down to two potential situations; home invasion at night and earthquake preparation. In the event that the place that you live gets broken into while you’re there, it’s of paramount importance that you can rapidly get to your personal defense weapon. Second to that, you should know how to operate that weapon safely and accurately inside the environment you’re intended to defend. 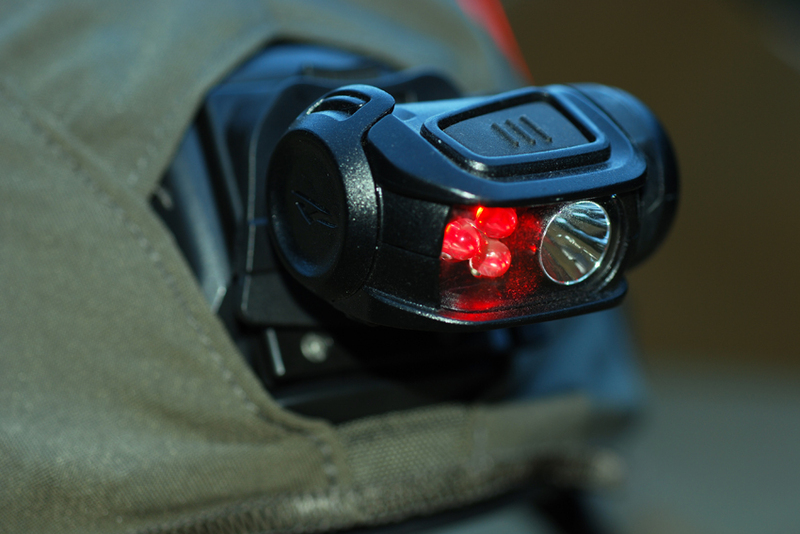 As a third layer of protection, if it’s an option, having your night vision device mounted and ready to use on a helmet that you can quickly put on, can be a very good idea. Obviously, if your home is invaded during the day, this is of little use, as daylight coming through windows probably provides you all the light you need to see a threat, yet at the same time, that light also allows that threat to see you. 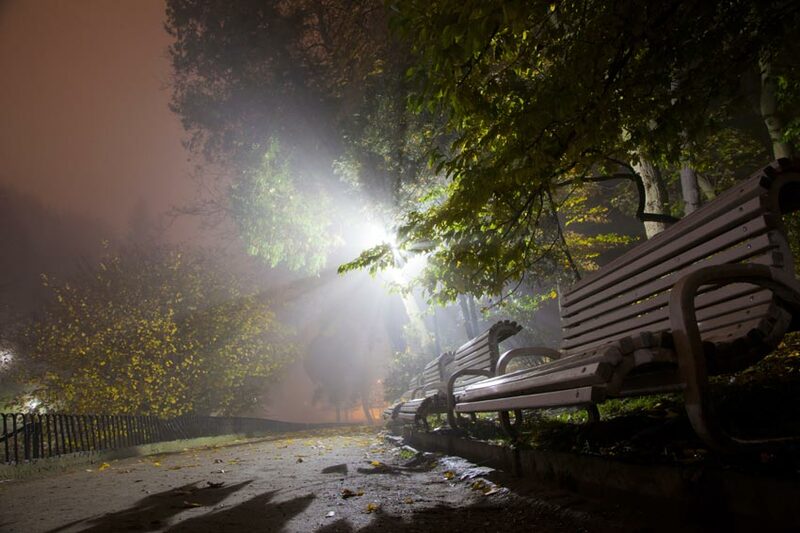 At night, the rapidly-donned NOD system gives you a distinct advantage against a foe who’s not only in unfamiliar territory, but can’t see in the dark. Like any other aspect of home defense, simply buying the gear doesn’t solve your problem; you need to practice moving through your home with nothing but the NODs on and you need to practice the methods you might have to use to defend yourself, together. This likely means that a night shooting class with handguns and NODs would be hugely beneficial, as it’s practicing what you learned there at home with the NODs on. This is where something like a SIRT training pistol can help, because if you’re anything like me, you probably have neighbors, significant others, children, or other people who would be a little disconcerted by you sending practice rounds down the hallway to your front door, no matter how noble the cause of your practice may be. The other type of incident I personally am prepared for in which I might find the helmet of benefit is earthquakes. Depending on where you live, you may have the potential of tornados, hurricanes, typhoons or other natural events which may result in building collapse or structural damage. I live in Northern California, so for me, it’s mainly earthquakes. Wearing the helmet could be a large advantage if you have to crawl your way out of the rubble that once was your home, or if you have to move debris out of the street you live on, or any other situation where it might protect you from getting a head injury. Having the helmet ready to use means I won’t have to dig through drawers or a pile of rubble looking for the particular accessories you might need once the proverbial poop has already hit the fan. For this reason, I keep one helmet packed away with the items I may need in such a disaster (namely a light that can be mounted on the helmet and either the GoPro or the Contour camera, for purposes of documenting anything you might need to document) in a soft-sided First Spear Helmet Hut. 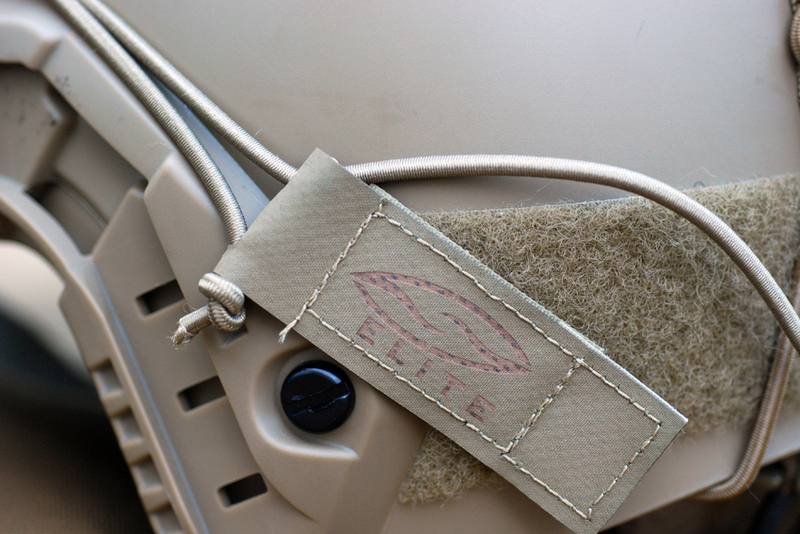 This also comes in handy when traveling, providing a safe, compartmentalized place to store all your headgear and accessories. In summary, there are plenty of useful and potentially-useful reasons to protect your head with a helmet. You can invest as much money as you feel comfortable spending on gear and the manufacturers will surely be happy to sell everything to you, but in some regards, money can be spent smartly if you do your research and shop around. Most of these helmet ecosystems allow for the use of Picatinny rail mounts, allowing you to cross purpose some of the rifle gear you may have already dropped a pretty penny on. So, do you need a helmet to protect you from being shot in the head? If you’re a civilian, probably not, but again that’s your choice. There are plenty of other perfectly good reasons for you to pick up something to cover your head with. At least that’s what I keep telling my fiancé.